One of three gravel pits currently filling with the diverted runoff near Canyon Creek. When the water is eventually turned off the water level will drop by about a foot every 24 hours in these pits as it makes its way to the aquifer. On April 3, Elmore County Commissioners and the City of Mountain Home worked together to take interested parties on a water tour. The tour was put together so those attending could learn more about the county's new project that will help to recharge the county's depleted aquifer. Elmore County currently has multiple water applications that they are pursuing. The water tour showed how the county is using one of the water rights we have recently been granted. 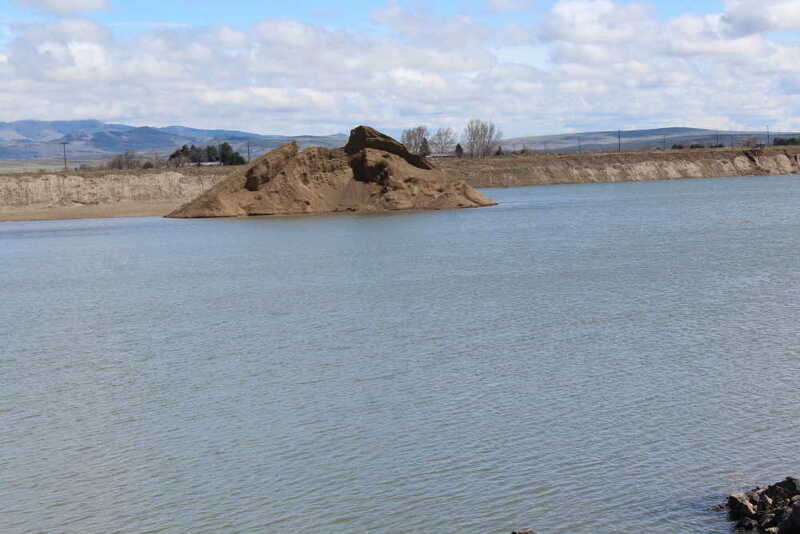 The new project is taking floodwater that is coming down from the foothills and diverting it to three local gravel pits. Once the water reaches the gravel pits it slowly makes its way down through the gravel and into the aquifer helping to recharge the county's groundwater supply. Before acquiring the right to divert the water, the flood water from the yearly snow pack would have flowed past us into the Snake River instead of being put to use by the county. Being a landlocked county the ability to recharge their aquifer is a huge deal with it declining by 30,000 to 40,000 acre feet per year. "It's a huge issue," Commissioner Bud Corbus said.